There have been significant debates within museums and museum studies for many decades about whether museums are primarily places for collections or places for narratives. Should museums be object-centred or people-centred – a temple or the forum, as expressed in Duncan Cameron’s 1971 dichotomy. In the digital age, the debate often coalesces around the use of multimedia in exhibitions: of the value of ‘virtual’ experiences versus interaction with ‘real’ things. In reality, the distinction is never so stark, as it is rare for museums to offer exhibitions that are entirely without objects. Multimedia is one representational element and strategy among many. 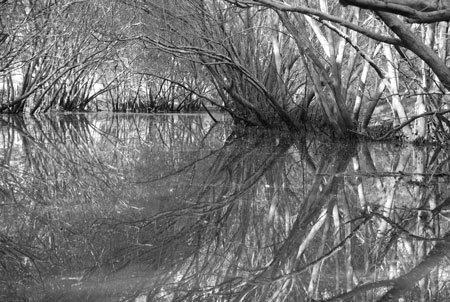 The exhibition Navigating Norman Creek, showing at the Museum of Brisbane in 2015, is a notable exception, as it is comprised entirely of short films. Described in the exhibition introduction as a ‘filmic exploration of Norman Creek by filmmaker, historian and local resident Trish FitzSimons’, the exhibition includes five short films and one ‘visual poem’ that, together, convey a powerful sense of place and community. Visitors encounter the visual poem upon entering the exhibition space. Occupying a large bank of screens, in a self-contained space with designated seating, the poem presents a journey along the creek, starting from its confluence with the Brisbane River to the creek’s headwaters in the outer suburbs. 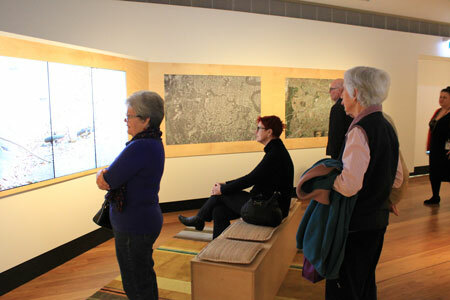 The viewers are oriented along the journey by projections of surveyor James Warner’s 1839 plan, which are punctuated by contemporary footage and historical photos. 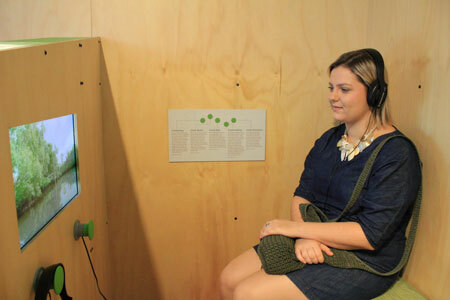 The five other films, titled Creek Boats, Creekology, Creek Making, Creek Kids and Creek Dreamers, can be viewed in small, separate pods that house seats, touchscreens and headphones and in which visitors can choose what they want to watch. Creekology, which provides an overview of the creek’s contemporary history, in particular the local community’s struggles for effective flood mitigation and protection of the creek’s natural values, is also presented on large, wall-mounted screens with an overhead speaker. Unlike the poem, which, as its name implies, is lyrical and experiential, the other films are more didactic. Built on narratives from interviews recorded with a diverse range of people with connections to the creek, they reveal different aspects of the creek’s history and contemporary meanings. The films range from seven to 11 minutes in length. As filmmaker and guest curator Trish FitzSimons describes in her statement on a wall panel in the exhibition, ‘these films percolated slowly into being over many years’. With funding from Brisbane City Council (which also funds the museum) and Griffith University, the films were made in association with the Norman Creek Catchment Coordinating Committee over a period of three years. The partnership model of the project is one of its great strengths. By working collaboratively with members of the committee and other local residents, the films draw on their deep memory and long-term commitment to the creek. The films articulate a strong sense of the local, of place, habitat and habitus, which is literally embodied through the community participants as they speak on film. Their stories and reminiscences are layered with sensitively filmed footage of the creek. Witnessing shots of rubbish and parts of the creek that have been engineered into concrete culverts becomes an emotional, even visceral, experience for viewers as the narrative establishes the creek as an entity that we know and care about. The films reveal an alternative perspective on the city – the view from the water. This is not the ubiquitous postcard or painting view of the Brisbane River, but a fine-grained, immersive view that takes us into the sediments of history, enabled by the capacity of the camera lens to experience the creek from multiple perspectives in space and time. Other capabilities of the film medium, such as the ability to scan slowly over items like maps and photographs, highlight how effectively it can be used to prompt the historical imagination of museum visitors. These items are enlivened and illuminated by being shown onscreen and, paradoxically, become more ‘object-like’ as a result. The camera lingers on details that are difficult to discern in original documents, such as handwritten annotations or the fluidity of the watercolour of Warner’s survey map. In this case, film also captures and directs the visitor’s attention in ways that objects may not have, by combining oral reminiscence or sound effects – such as children playing or water trickling – with historical imagery or, alternatively, layering reminiscence over contemporary footage and fading between black and white and colour; moving and still images. For me, the exhibition demonstrates that film can achieve everything that museums aspire to, without objects. The richness of the narratives and the skill and subtlety of the filmmaking creates a multifaceted experience of Brisbane’s past and present – clearly fulfilling the goals of a city museum like the Museum of Brisbane. That they are lesser known narratives that recognise community activists, volunteers and others responsible for caring for our waterways, is also significant. The light curatorial touch of film gives voice to communities and community memory and, in this exhibition, embeds the museum in the social ecology of the city. Public programs, which include hosting a panel of speakers at the Moorhen Flats Bushcare Group working bee and a kayak tour, led by Trish FitzSimons, exemplify the possibilities afforded by community partnerships such as this. 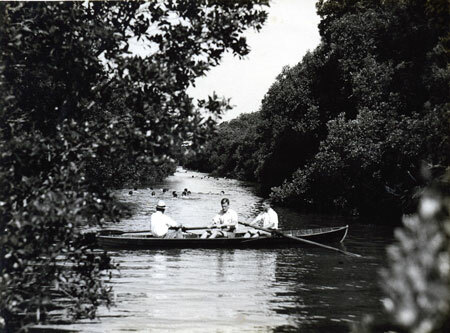 The films are now available on the museum’s website and YouTube channel (https://www.museumofbrisbane.com.au/whats-on/navigating-norman-creek/). It begs the question of what the difference is between watching online and watching in the museum space? While it means that the audience for the films will continue to grow, viewing online is a different experience to that available in a museum, which is, after all, a social space. Each time I visited the exhibition, there was always somebody in a pod, fully absorbed and watching all of the films in turn. Others were occupied by the large-scale presentations. Children, of course, are attracted to screens like moths to light. In providing options for how the material can be viewed, the exhibition design effectively accommodates these different levels of engagement. 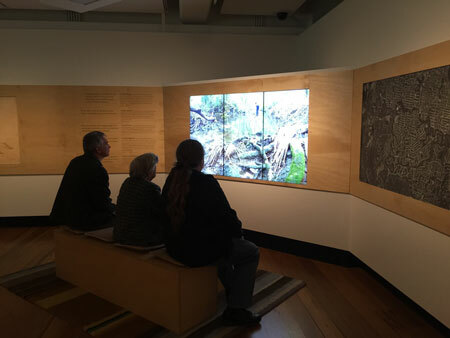 The only non-filmic objects in the exhibition are two large, aerial photographs of the creek catchment, one historical and one more recent. 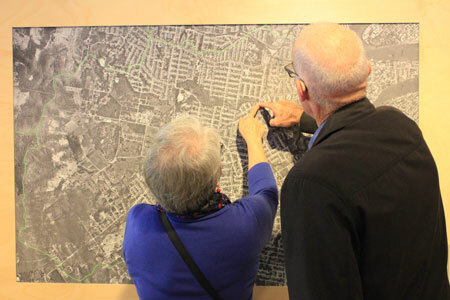 Aerial photographs are of great interest to audiences, and these are no exception, being the focal point of many visitors’ attention and conversation. The careful balance struck between objects and narratives in Navigating Norman Creek, which emphasises the multimedia component, ultimately creates a meaningful museum experience. Jo Besley is an independent curator and doctoral candidate in museum studies at the University of Queensland. She was formerly Senior Curator, Social History at both the Queensland Museum and Museum of Brisbane.